On Europe Day (9 May), the European Cultural Foundation (ECF) has presented four outstanding laureates with the 2017 ECF Princess Margriet Award for Culture: literary writer and columnist Aslı Erdoğan (Istanbul); writer and scholar Navid Kermani (Cologne); musician Luc Mishalle (Brussels); and visual artist Marina Naprushkina (Berlin). Novelist, orientalist scholar and journalist Navid Kermani’s writing spans many forms. As a writer he has produced novels, media reports, plays and children’s books and is known as a literary cosmopolitan who is never satisfied with simplistic answers or simple identities. His fiction deals with existential subjects including death, rapture and art. As an academic, Navid has displayed a detailed historical understanding of how Eastern and Western intellectual undercurrents intertwine. As a journalist, he has offered insightful perspectives on the acceptance of migrants, countering divisive views on refugee issues. Navid Kermani’s exceptional contribution to cultural debate has been to challenge increasingly extremist narratives of discrimination and racism, arguing instead for greater solidarity in the face of fragmentation. 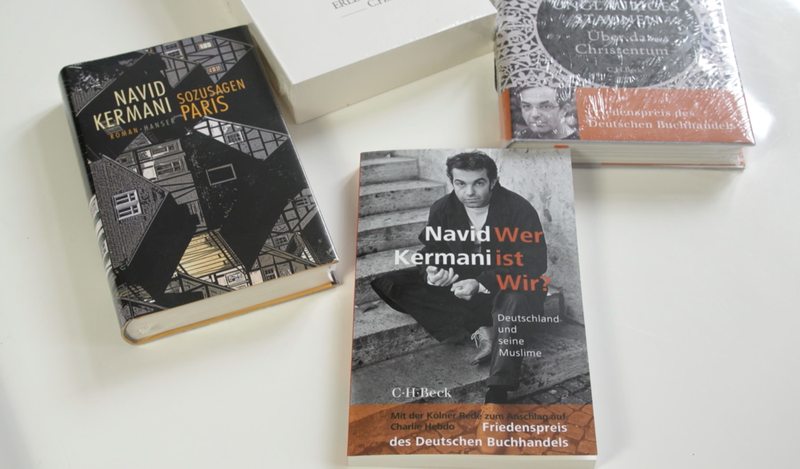 Kermani's critical thinking and contribution to public debate provides a necessary counterweight to the increasing nationalistic, xenophobic and anti-egalitarian attitudes that feed a polarising narrative of “us versus them” as seen with the rise of populist right parties across Europe. The idea of a common Europe is buckling under a widespread rejection of the European project. Navid Kermani spoke with filmmaker Alexander Dluzak and ECF curator Wietske Maas about the importance of recognising cultural memory that is commensurate with the complexity of the past. This is a translated and edited transcript of a conversation that took place on 15 March 2017 in Berlin. What is the responsibility of culture to help overcome this polarisation in Europe? How can culture contribute to a new collective notion of “we” that resists the dichotomy of ourselves and the other? It’s our task to show that the world is complicated. It doesn’t explain itself through simple slogans. I think that economic factors are often ignored. Yet so much is based on an issue of rich and poor, of inclusiveness and exclusiveness. Aggression and repulsiveness translate into cultural language but the fact is, the problem at its heart is of a social nature. We underestimate this and continue to do so. That’s one of the many reasons I am a travel reporter, because it makes me aware of the social conditions, which is something you can not find in 19th century literature, this is something you need to experience first hand. I see how grotesque these differences are becoming: the wealth is exploding, yet, at the same time, a large percentage of the population is becoming more and more impoverished. In your journalistic work you critically reflect on social political, realities, reporting from regions of war and conflict. Most recently you travelled to Chechnya. In 2015, you published your account of your travel to and along the refugee trail published under the title Einbruch der Wirklichkeit [The Intrusion of Reality]. Is this journalistic process very different from your work as a fiction writer? I don’t change my language if I write for another medium. My books, my travel reportages: it’s the same voice but with a different purpose. When I do reportage of course it’s about portraying a reality that can be proven and that my text has to live up to, whereas my literary work is a totally different kind of freedom. I am naturally a profoundly curious person and I use this to make my books as well as my travels and journalistic pieces. That’s why I cherish making my travel reportages. It’s important to learn more about and experience other regions and countries and learn to understand people and what drives them, because in the media they are portrayed as this grey mass instead of individuals, strange and difficult to grasp. It changes a person to experience a warzone. It shows you what truly matters. Much of what we experience in our daily lives becomes unimportant once you’ve spoken to someone who has lived through torture. It doesn’t mean that the big feelings, our lives are unimportant. Love, grief … these feelings are real and deserve to exist no matter where in the world, no matter if other people somewhere else are suffering. But the little problems of our day to day lives, they vanish in the light of these stories and experiences. You draw striking comparisons between oriental and occidental literary traditions and cultures, uncovering deep affinities between oriental intellectual currents and the foundations of European literature. Oriental or arabic culture is an intrinsic part of Europe itself. Yet Europe has defined itself by creating an identity distinct from the orient or arabic cultural area. It’s a normal cultural process to use forms from other cultures and, at the same time, to differentiate from them. In so doing, one creates something new by defining oneself all the more through these differences. For example, if one wants to truly understand a big part of European literature and one also has a knowledge of the oriental, then influences and connections are obvious. One wouldn’t exist without the other. Dante’s Divine Comedy cannot be truly understood without its oriental predecessor. It’s not just about geographical boundaries. Someone growing up in Tehran could be much more European in the sense that he or she was educated by and influenced by European culture, than someone, say, living in the Netherlands or Germany or Sweden. You have said that the problem Islam is facing is not the tradition itself, but much more a total disruption of tradition. The loss of its cultural memory. It’s dangerous to not know the background of religious writings. It makes simple answers very plausible. A classic Qur’an verse of the eighth or ninth century is written to be interpreted on different levels and in different ways. This is a way of thinking, not giving a single answer but instead interpreting realities on several levels. When the consciousness of the past is lost, one is prone to being misled. In that sense, fundamentalism or nationalism is not an expression of cultural confidence but rather of cultural weakness. It becomes very dangerous when one does not have this historical consciousness. Fundamentalism or nationalism do not arise when one has this awareness, but where one is uncertain. How does this uncertainty you talk about come into being? It’s a result of globalisation, which in turn is a phenomenon of the middle classes. A middle class family in Delhi is similar to a middle class family in Sao Paulo. The same clothes, the same shops, the same information. The more our ways of life become similar, the more the need to differentiate ourselves. Religious fundamentalism is not only a phenomenon of the poor - of the rural population and traditional worlds of life, but it is also a phenomenon of the middle classes in which one experiences the changes globalisation brings about not always in a positive way, but rather as something being taken away from us. So you see the nationalism of the Western countries as comparable to religious fundamentalism? Well, it’s always an identity discourse. Who are we, or as I write in one of my books, “who is ‘we’?” How do we define ourselves and differentiate ourselves from others? In the Islamic world throughout the last century, this has mainly happened through a religious self-image. But when these identities are created through fear, through an aggressive and repulsive attitude towards the other, by denouncing the other, as in nationalism and fundamentalism, things take a dangerous turn. This is the story of both world wars. This “We versus Them”-feeling could never do justice to the complexity of reality. All images are stills from the ECF Princess Margriet Award for Culture portrait film directed by Alexander Dluzak.